The leopard: a solitary creature that because of its preference for living in dense bush, and its nocturnal habits, remains well hidden and seldom, if ever, seen earning it the labels: secretive and elusive. They are strong, comfortable in trees, and adept climbers who think nothing of hauling their kill up into branches. Closely related to lions, tigers and jaguars they are listed as Near Threatened on the IUCN Red List. Outside of Africa, many of them are endangered. There is a long history in South Africa of conflict between farmers with live stock and leopards. There is also little information about leopard populations or their conservation status. Tourists who come to South Africa expecting leopard interaction are disappointed. Whilst numerous places offer up close and personal moments with elephant, lions and cheetah, leopards very seldom put in an appearance for photo moments. On the whole, a bit of sleuth work might pay off if you intend spotting a leopard. It is no secret that there is a long history of conflict between stock farmers and conservation authorities over the leopard in the Baviaanskloof. In 2010 studies indicated that only between thirty and thirty-five leopards remained in the 300 000 hectare mega-reserve. One of Cape Action’s projects is to develop a better understanding of the nature of this problem. 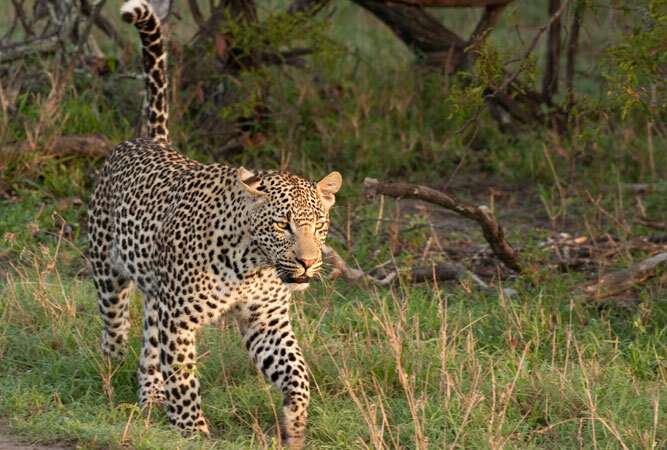 As a visitor there is little chance of spotting a leopard, but you can, hopefully, soon walk the path of the leopard and follow their spoor on the soon-to-be-opened Leopard Trail – a 5-day hiking trail through parts of the World Heritage Site only accessible on foot, with overnight in chalets. The South African portion of the Kgalagadi Transfrontier Park, the Kalahari Gemsbok National Park, is a place of predators – roughly 200 cheetahs, 450 lions and 150 leopards dominate the sandune and scrubland-ridden landscape that knows no borders between South Africa and Botswana. 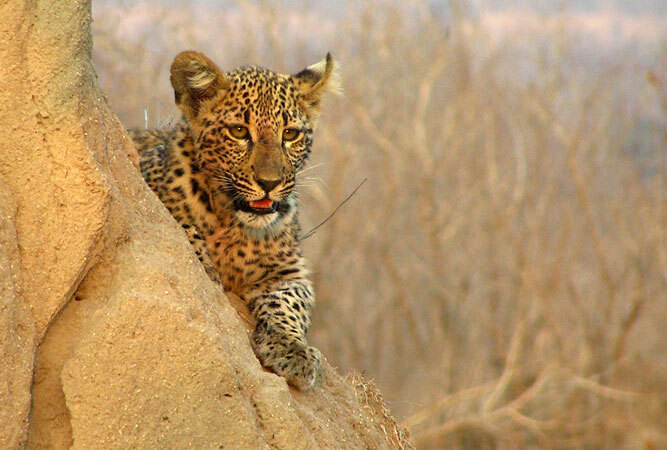 Leopards in the south-western portion of the Kgalagadi have the largest recorded ranges in the world. Since the reintroduction of lions into the Karoo National Park – the first in over 170 years – this park that lies in the Great Karoo, a rather unforgiving landscape dominated by the Nuweveld Mountains, has become a whole lot more interesting to visitors. The Cape mountain zebra, the endangered black rhino, riverine rabbit, and the leopard come in at a close second as attractions to the reserve, whilst the 20 pairs of black eagle mean that birders particularly love this rugged landscape. 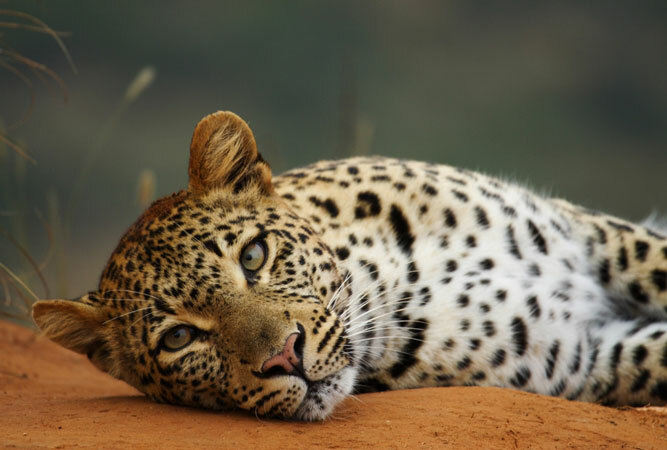 The Soutpansberg is said to have one of the highest leopard densities in Africa. In similar vein to the Baviaanskloof there are consistent conflicts between farmers and the predators resulting in a high mortality rate of leopards. 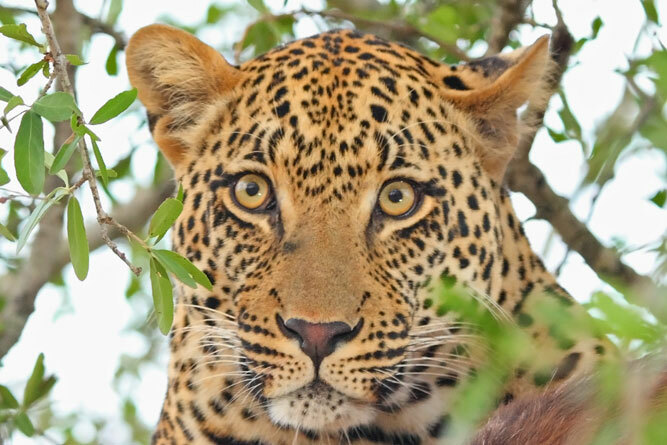 Places like Leshiba Wilderness Game Farm, where one can walk without restriction and unguided in amongst the animals, offers a high canopy forest with over 335 species of trees offering shelter to the leopard, seldom seen, but nonetheless present. Leshiba stretches along the top of the western Soutpansberg Mountains – ideal leopard habitat. Whilst Nambiti today boasts Big 5 viewing, it was not always so. The leopard is the only of the wildlife to have always frequented the area, even when it was mostly cattle and game farms. 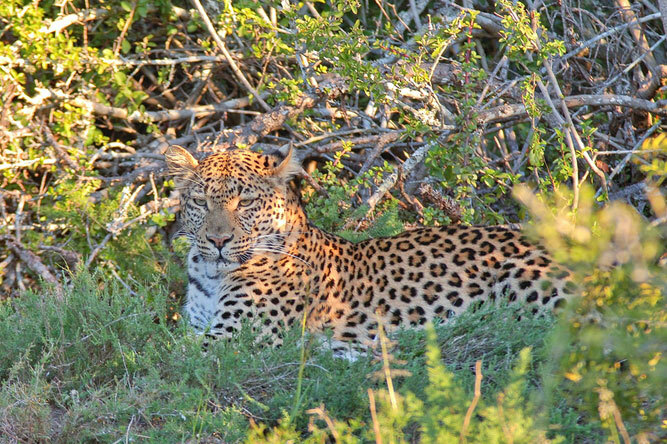 Nambiti has also released further leopards into the reserve. Despite this, sightings are rare and the closest you may come to them is footprints. However the conservancy is home to the Kwa Cheetah breeding project that, whilst focusing on cheetah, includes Vega – a young leopard male brought to the reserve as a cub. Along with many of the other reserves that boast the Big 5, catching a glimpse of leopards at Phinda is erratic at best. Sighting guarantees do not come easy when it is the leopard you are after, but Phinda tracks cheetah, lion and leopard on a daily basis. As a result the reserve is regarded as KwaZulu Natal’s answer to Sabi Sand; lion and leopard sightings are plentiful. The other draw card to Phinda is experiencing the Big 5 in lush surroundings – subtropical woodlands, grasslands, mountains and wetlands make game viewing a very different experience to the drier regions further north. Home to four of the big five, including the leopard, Plettenberg Bay Game Reserve is the southern Cape’s largest game reserve, close to the coast. For those who cannot make it further north for Big Five game viewing, this is a wonderful space in which to see game. The 65 000 hectare private game reserve lies on the south-western corner of the Kruger National Park, with no fences between it and Kruger. Leopards are by far the main attraction of the reserve. They are said to be so accustomed to vehicles that they barely notice if a game drive follows them through the bush whilst in the midst of a hunt. Sabi provides photographic safaris for capturing lion and leopard on film, so sure are they of their up-close leopard sightings. The isolated, vulnerable Cape leopard population occurs in the mountains of the Northern, Eastern and Western Cape. They are so seldom seen that even Dr Quinton Martins, the man behind the Cape Leopard Trust, has spotted them only seven times in the Cederberg during his research of the last ten years. The Trust offers guided environmental day trips into some of the many nature reserves of the Western Cape in which leopards are found. You may not see a leopard, but you will learn a great deal about them. Just 75 kilometres outside of Port Elizabeth, Shamwari has won the World’s Leading Safari and Game Reserve, and Conservation Company awards numerous times. The reserve is not only home to the Big 5, including the leopard, but also gives sanctuary to several leopards and lions discovered in poor conditions in circuses or zoos around the world as part of the Born Free Foundation, which has two centres at Shamwari. Guests to the game reserve have access to these rescued animals. A chance to see leopards up close. Leopards of the Tsitsikamma and Outeniqua forests keep well below the radar, their presence virtually undetected. Of the lion, rhino, hyenas and other large mammals that used to frequent the area, it is only the leopard and elephants that remain – neither of them are obvious about their whereabouts. 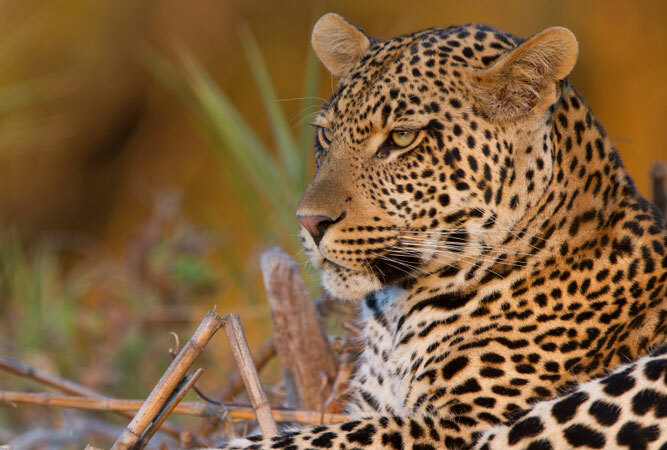 Numbers are not conclusive, but a 2009 study indicated that there were fewer than 30 leopards left in Tsitsikamma, due mostly to conflict with farmers. There are a number of ongoing projects to support both farmers and leopards.